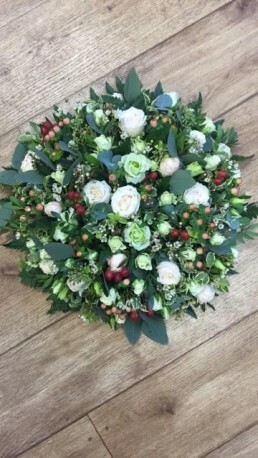 A beautiful posy made with a selection of cream and green blooms arranged in a traditional style to create a beautiful funeral tribute. The choice of flowers in this design are sure to include only the highest quality stems, used at their peak to ensure they are looking their very best for the occasion. The standard size of this design is 10 inches in diameter, deluxe size is 12 inches in diameter and luxury size is 14 inches in diameter. Please provide as many details about the funeral as possible to ensure delivery is as required, specifically the name and address of the undertakers. 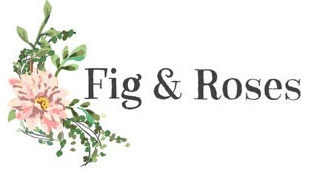 Every arrangement Fig & Roses make is arranged by our experienced florists, using the freshest seasonal flowers and will be delivered with a hand written message card. Please note, seasonal variations may apply, and due to the nature of each arrangement being custom made by hand, the picture shown here may not entirely reflect the final product.